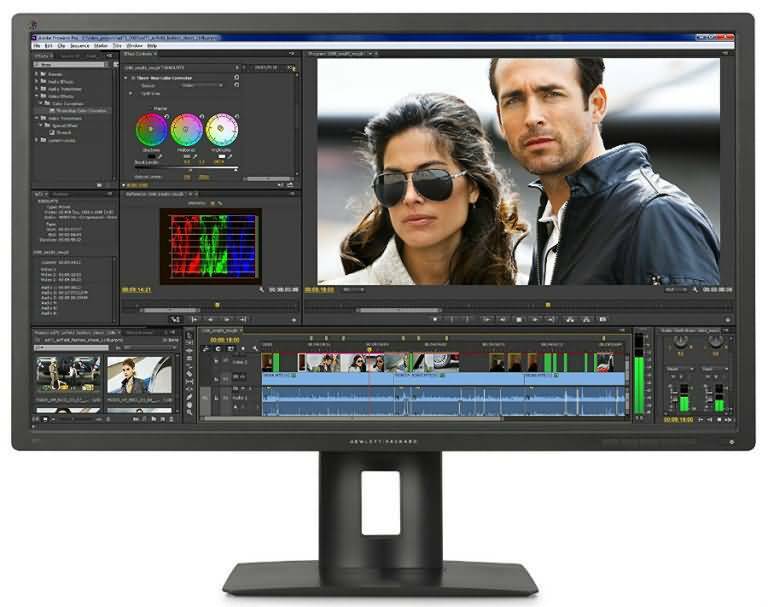 If you are searching for a professional quality monitor then HP DreamColor Z32X must be the perfect choice for you. This monitor is designed with extra sharp resolution, precise hue adjustment and many more settings that suits to business environments. However, many gamers love to play games on its wider screen that delivers classic response for graphics. This 32 inch monitor is designed to maintain higher color accuracy. There are lots of unique specifications and advanced features that you need to know about HP DreamColor Z32X before making your next investment for a 4K monitor. The review below will help you to know most of interesting things about this big screen display. It delivers excellent response for color reproduction. Offers intuitive on screen controls. Delivers highly accurate gamma performance. Picture quality is impressive enough. There are lots of intuitive controls over screen. Contrast settings still need little improvement. It generates noticeable ghosting effect. Few screen adjustments demand additional built in tools. DreamColor Z32X ensures powerful aesthetics with professional style finesse and its highly functional design assists in easy usage. Most of users would not like its thicker bezel but you will not find them much distracting. The panel is finished with matte black finish but it is not much stylish. The whole exterior of this 4K monitor is designed using plastic material and the craftsmanship is definitely appealing. The assembly is perfectly adjusted and it seems durable enough with fine design option. How can we forget to talk about its stand that has minimalistic design. All these features make this monitor suitable for business applications but you may have to make little efforts to create space for this large size monitor. The stand is durable enough and can easily handle this large size monitor. It can be easily adjusted for pivot, swivel, tilt and height shifts as per need. There is a well managed hole that helps to manage all cables very well and this monitor can also be used with VESA mount. If we talk about the connectivity and ports then you will be able to manage enough peripheral connections with ease. This professional class monitor comes with one DisplayPort 1.2, 4 USB 3.0 ports, HDMI 2.0 and 1.4 ports and Mini DisplayPort 1.2 port. 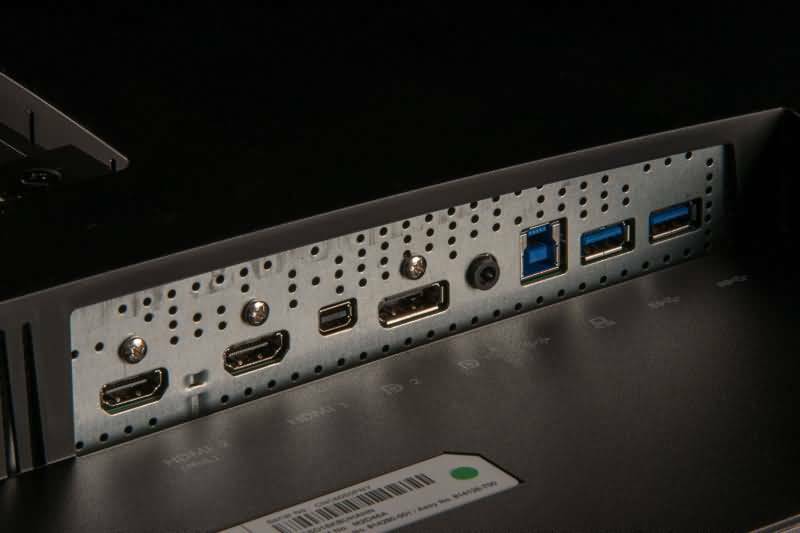 You will find two USB ports on rear side of this monitor whereas rest two are available on left bezel. It also includes one 3.5mm audio jack but the speakers are missing in this 4K monitor. However, users can access LCD speakers of HP via this audio jack. Most of the settings for improving performance of this monitor can be done from five simple buttons. Although, these buttons are not much stylish and not even like joystick based controls but still you will find them useful enough as they work well. It is much easier to make adjustments for contrast and brightness from on screen controls. This monitor serves users with wide list of image quality adjustment options such as picture in picture, image scaling, sharpness, in depth RGB personalization, BT.709, AdobeRGB, sRGB and brightness. These settings not only supports fine calibrations but at the same time they assist in handling several input sources at a time and also manage low resolution response. With all these advanced colors, you will miss a few essential ones like color temperature settings and gamma controls. If you want to adjust them then it is advised to buy HP DreamColor Calibration Solution Kit. HP DreamColor ensures 3840 by 2160 resolution on its 32 inch 4K monitor where you can manage content at refresh rate of 60 Hz frequency range. This monitor comes with pre calibration from factory itself where sRGB can produce 96% response and Adobe RGB technology leads to 92% accuracy. The Delta E value is rated to be 0.9. All these values need little improvement to meet professional needs but if we talk about the gamma curve then it is observed to be at 2.2 with lower threshold adjustment for error. Moving ahead towards contrast settings, this 4K monitor delivers 520:1 contrast with brightness level of 50%. The gamma range is again fixed at 2.2 that delivers bland response for grays and blacks but the overall shades appear much lighter as compared to standard settings. The screen delivers fine response for artwork and pictures with its enhanced settings for saturation and vibrancy that makes things lifelike. Results can be further enhanced with adjustments of advanced filters such as BT.709, AdobeRGB and sRGB. DreamColor Z32X comes with factory calibration and it represented satisfactory performance for out of box tests. When adjusted to AdobeRGB mode, it leads to 92 percent accuracy whereas sRGB color gamut response was observed to be 96%. You will find its Gamma curve sitting at perfect value of 2.2 where professionals noticed average difference in color of 0.88 only. With all these features, this monitor result stunning color reproduction and it is rated to deliver impressive color distribution even when it is turned on for the very first time. The out of box performance can be little improved with the help of post calibration settings. After applying these adjustments, sRGB response was improved up to 97% whereas Adobe RGB was increased up to 93%. It leads to little decrease in color error where value shifted to 0.84 from 0.88. Even with these small improvements, the color delivery was much improved. As this 4K monitor is dedicated to professional display needs but it cannot be recommended to high end gamers. The major reason behind its degraded performance for latest UHD gaming needs is the limited responsiveness. This device is observed to have slow pixel transition rating of 8ms. This issue further leads to noticeable ghosting and interlacing troubles. If you want to get rid this of it then it is advised to choose a faster monitor that can manage graphic card response with faster refresh rate and faster response time. Its response time for gray to gray adjustment, input lag and ghosting effect does not allow gamers to have fine gaming response on this monitor. Gamers are more dedicated to receive sensitive response for all these artefacts so they cannot accept this unacceptable flaw. While testing responsiveness of this 32 inch 4K monitor it was found suitable for casual needs because if you prefer to use it for faster sessions or like bleeding edge monitors then it will cause delays. However, when its performance was compared to Samsung U32D970Q then it was found little faster than that. Although, this monitor has lots of advanced features and it works fine for most of office and studio needs but due to absence of G-Sync and FreeSync it is not able to deliver satisfactory performance for gaming needs. Professional gamers are advised to drop the idea to buy HP DreamColor but it looks fine for photo and video lovers. HP Dream Color Z32X is well known for its excellent professional quality service; the precise color delivery with higher resolution management leads to better performance. You will definitely appreciate its higher gamma range accuracy that provides life like picture response so that professionals can have quality editing time. However, this monitor is not suitable for gamers but office and studio users will find it perfect for their needs. The on screen menu is intuitive enough so users can manage all settings with ease. For all these quality features, you need to pay little higher amount.